Madeira's favourite map just got a whole lot better. Madeira Tour & Trail Map is now on a larger 960mm by 700mm double sided map sheet. 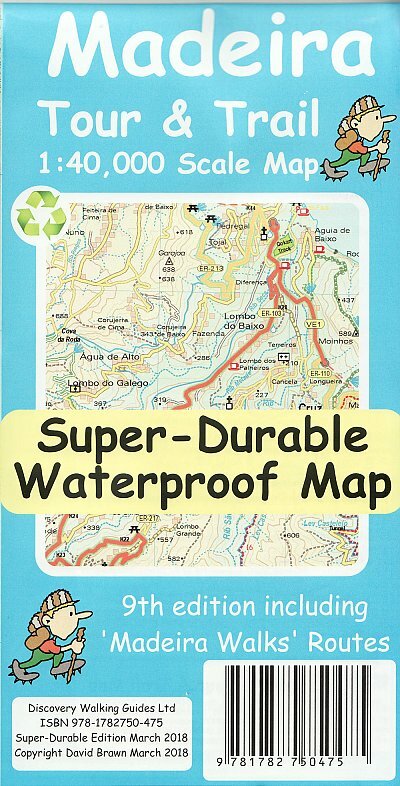 The Super-Durable edition comes with a 2 year adventurous use wear and tear guarantee, see Discovery Walking Guides website for details.This most detailed map of Madeira includes the 'Tour & Trail' level of detail ranging from major roads to secondary roads to minor roads to streets and camino rural narrow country roads, plus dirt roads and walking trails. Altitude background colouring is designed to clearly show the altitude range when travelling across the island by car or on foot. 100 metre and 50 metre contours are clearly shown on the map along with a large number of individual height points and all of the official 'Trig' points. You will easily identify springs, caves, sports grounds, cemetries, churchs, chapels, lighthouses, towers and forts, camping areas, wind turbines, hotels etc. For adventurers on foot Tour & Trail Maps are researched and designed by hikers for use by hikers. Comprehensive gps ground surveys produce the best mapping available but the value of this on the ground research becomes even more important when you leave the tarmac. All of our DWG walking routes are accurately gps surveyed giving you confidence in the accuracy of our Tour & Trail Maps. Madeira Tour & Trail Map 9th edition includes all the walking routes from 'Madeira Walks' volumes 1 & 2 by Shirley Whitehead highlighted in Red while other published walking routes (Rother & Landscapes) are highlighted in Green. It all adds up to the most useful map of Madeira that you can buy anywhere. In use maps have a very tough life so you will appreciate our specialist concertina map fold that allows you to quickly open the map, and more importantly fold it back up to its pocket size after use. Paper maps will always suffer from the repeated unfolding, folding to the section you want to use, and then refolding. We recommend everybody to obtain our Super-Durable editions printed with 100% oxygenation inks on Polyart by the UK's leading map printer, which produces a map that feels like silk but will stand up to the roughest treatment of outdoor adventuring and yet fold up like new at the end of your adventure. 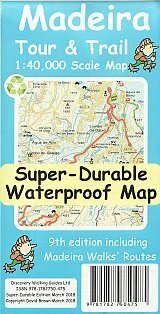 Tour & Trail Super-Durable Maps are more expensive than paper maps, but represent better value as they produce a lightweight map that feels like silk while being both water-proof and incredibly tough so that after even the toughest of adventures your Tour & Trail Super-Durable Map will fold up like new. Polyart is made of high-density polyethylene (HDPE) and is therefore 100% recyclable in category 2 HDPE. For more information see the Polyart website.